Alexey Mordashov has become the latest billionaire Russian businessman to make headlines in the Western media. Until recently Mr Mordashov was relatively unknown outside of Russia, but he is now set to control 32% of the world's largest steel company, after the merger of his steel firm Severstal, the biggest in Russia, with European giant Arcelor. For Mr Mordashov, now 40 years old, it represents the culmination of a rapid career trajectory, which begun when he got an office job at his local steelworks back in what was then still the Communist-run Soviet Union. Reports of Mr Mordashov paint a rather contradictory picture. On the one hand, he has earned the nickname "the tank", a self-styled "iron man" not to be messed with. He is seen as the de facto leader of the Russian city of Chereprovets, approximately halfway between Moscow and St Petersburg. He wielded quick-footed and complicated financial deals to secure ownership of Severstal from the rush to privatisation in the 1990s Russia, and is thought to have the ear - and favour - of Russian President Vladimir Putin. Yet other reports describe Mr Mordashov as an unassuming, thoughtful and hardworking entrepreneur - an ambassador for Russia at World Trade Organization meetings, and since 2001, the holder of a masters of business administration (MBA) degree from Northumbria University in Newcastle. Born in 1965 and a graduate of the then Leningrad Engineering-Economical Institute, Mr Mordashov joined the Cherepovetskiy Metallurgical Plant in 1988 as an economist. In 1992, after the old Soviet Union collapsed, he was appointed financial and economic director of Severstal, the new private company created to run a mass of Russia's steel interests. 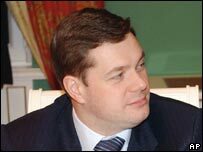 In 1996, at the age of just 31, Mr Mordashov became chief executive: a position he has retained ever since, although he has since also added the title of chairman. The late US investigative journalist Paul Klebnikov suggested in Forbes magazine in 2004 that Mr Mordashov secured ownership of Severstal by ousting his former boss. Mr Klebnikov further said that Mr Mordashov used the firm's vast steel earnings to buy up shares originally issued for its staff. Mr Mordashov insisted in the same article that "we never seized anything, we never twisted anyone's arm, we never used state organs or corruption". He added: "We paid for everything we acquired." Through a range of investment vehicles, Mr Mordashov today personally owns 89.6% of Severstal, and has built the company up into a business with annual revenues of $11.7bn (£6.3bn). In additional to steel, Severstal now has mining, automotive, plywood, banking and insurance interests. His stake in Severstal means that the merger is set to award him a high degree of control over an enlarged Arcelor: 32% of the shares, together with 6 out of 18 seats on the board. While some analysts have raised their eyebrows at Arcelor choosing to merge with a Russian firm, Mr Mordashov has described the deal as a positive breakthrough for both his company and Russia's international image. "It's a new culture for us Russians, it's a big step forward," he says. It remains to be seen what benefits or potential disadvantages Mr Mordashov will bring to the new Arcelor company. A spokesman for Mittal, whose hostile bid for Arcelor would fail given a successful Severstal deal, warned: "Effectively [Mr Mordashov] can do whatever he wants with the company." But in an interview with BBC Radio 4's Today programme he denied that, saying: "We created very balanced corporate governance, representing minority shareholders' interests. "For example, I took a written obligation to vote in line with the decision of the board of directors." He added that consumers should not worry about a Russian company having a large stake in its steel supply. "Now Severstal makes 40% of its steel outside of Russian, in the United States, in Italy and France," he said. "Consolidation, in our view, is very good for steelmakers and steel consumers because it brings stability and better opportunity for steelmakers to supply good quality steel at a low cost."